High school ... ahh, high school, just as I remember you, complete with teen angst, naive relationships, the pressure of study, an underlying desire to make friends and fit in, and the odd gruesome murder to solve ... wait ... maybe that was just from watching too much Buffy. 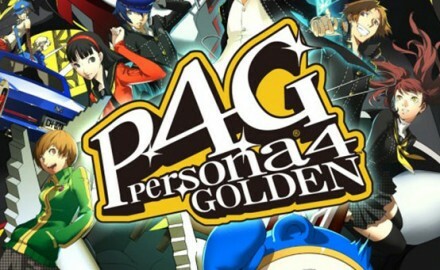 So Persona 4, or to give it it's original full moniker, Shin Megami Tensei: Persona 4. Yes, I know it's a relatively older game, having first come out way back in 2008 in Japan. That's practically geriatric by today's standards. However with it's much more recent port over to the Playstation Vita, I finally had a chance to check out a game that I'd missed out on the first time around. Lots of my friends and colleagues raved about the series so I felt that I had to get around to checking it out. 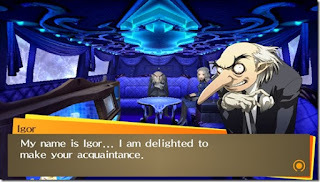 While I am a fan of a good JRPG, I'm not the type that enjoys a comprehensive knowledge of Japanese culture, and the Persona games had always struck me as, well, a little odd. 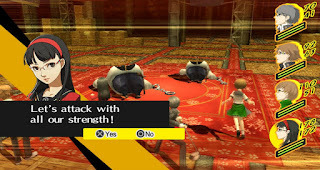 You play as Japanese teenagers trying to solve a series of bizarre murders (as you do) by using the powers of your inner persona, which in good old fashioned JRPG tradition manifest as capable fighting monsters when you pass through into the games alternate reality. It is also crammed full of Japanese culture and references, much of which will invariably seem a little odd to a western audience. While a traditional fantasy outing this is not, it's all kinds of wonderful. At it's mechanical core, is a system that is fun and engaging and has just the right amount of complexity. Each character has a Persona that levels up as they do that loosely fit into the broad JRPG categories you would expect. You can let them do their own thing, or command them directly in battle, which boils down to the usual tactical rock, paper, scissors type affair of finding weaknesses and exploiting them. Your own character has the unique ability to collect and 'fuse' persona's so that you can build new variations and skill-sets for yourself. It's kind of a variation of what we have come to expect from a good JRPG. The flow of gameplay also hinges on a great device, the concept that the game drives along, on a calender, with time progressing whether you want it to or not. Each day is split into separate sections, early morning, at school, afternoon, evening etc, and you can only perform one action per section. Whether it is hanging out with friends to raise your social bonds, running a dungeon to level or up collect loot, study for your exams, read a book, work a part time job, go to the cinema, train with the sports teams or practice for the school play ... you have to choose. You can't do everything all of the time, and it adds a fantastic time management element which works nicely for the games pacing. It also means that the narrative can shift when it needs to, placing urgency on you when required (as certain events are pre-ordained and the game does a great job of warning you), and also allows downtime now and again to let you choose what to pursue. Everything links back into your Persona's abilities, or the fusing system, so there is always a point to your social interactions. You never feel like you are wasting time, and each choice feels real, with a real consequence. You will always have more to do than you have time to do, yet the game never makes you feel as if you are missing out. It's quite brilliantly balanced. For me it's a great solution to many of the challenges in pacing a fully laden JRPG experience, while still keeping a good narrative pace. All too often JRPGs can suffer slightly under their own weight and the sheer amount of stuff that there usually is to do. I mentioned Buffy before, and it's a solid comparison. This game works, as that show did, not because it's cast of characters fight monsters, happen to have supernatural powers, and take on forces of evil from beyond normality. No, it works because the characters are believable and while yes, they do more than occasionally start slipping into stereotype or cliche, you can relate to them. They have human stories. Each central characters persona is another element of their personality they have kept hidden. At first this approach can seem more than a little naive. It's all very teen cliche, with insecurities, questions of sexuality, and confidence all being manifested as challenges for the characters. Slowly though you start to feel that these characters are real, in particular as you start to build up the supporting cast of the game. Even small side characters can have oddly effecting and interesting stories to tell, and by placing an importance on these social bonds the game encourages you to treat these characters as just that, characters, and not just as means to another stat bonus. 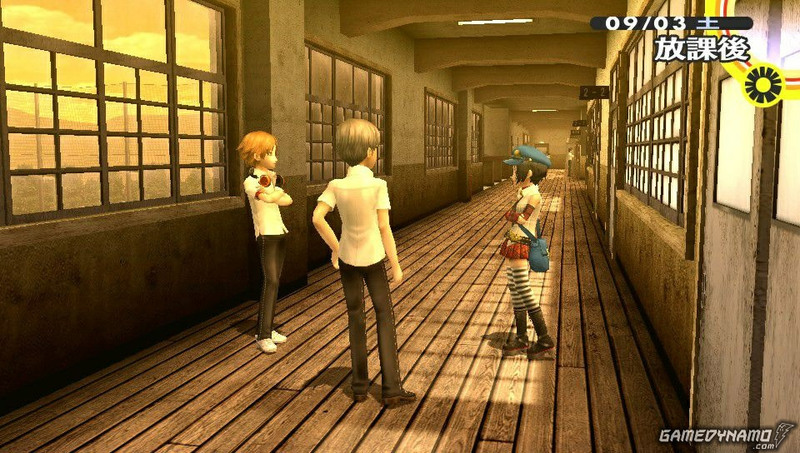 They don't all hit the mark, and some are played for comedic effect to mixed success (Kanji in particular), but overall you quickly come to care for the cast and the townfolk on Inaba, the quiet small town location where the game is set. Characters have flaws, ambitions, strengths and desires. They go to school, work, have family pressures, expectations, and all the worries that go with normal life. It sits, side by side, with the supernatural dungeon fighting, and somehow, masterfully, doesn't feel out of place. Yes, the story itself, and the explanations for what is going on is all kinds of bizarre, in the way that you often just have to accept JRPGs are. However once you let yourself accept that, it drags you in and doesn't let you go. Encounters with mystical figures who reside in a blue velvet interior of a limo, complete with mini-bar, that seems to float through time and space, will seem reassuringly normal. Really, trust me, it will. That's the true strength of the game, it makes the absurd acceptable by treating it as if it was the most natural thing you can imagine, and then surrounding it with a cast of characters that you will come to care for, understand, sympathize with, and want to see succeed. While it helps that there is a fantastic RPG system at it's core, the true success here is that Inaba becomes your own little Sunnydale, and fighting demons alongside studying for your midterms simply seems like the best way to spend your Thursday evening. Also, lastly, the Vita is a great fit for the game. The pacing and calendar system allows for bite-sized digestion, while longer sessions are not uncomfortable either. It has been a great travelling companion for me on the last few trips. Thoroughly recommended port!